So, it's March (although the snow on the ground here clearly hasn't noticed.) Which means that a few weeks ago I got an email from the lovely people at NaNoWriMo inviting me to sign up for Camp NaNoWriMo. Being the sensible writer I am I of course signed up immediately. But I figured some of you might not know that Camp NaNoWriMo is the sensible course of action so I thought I'd write up this post for those of you. If you haven't done a NaNoWriMo type experience before, you might not know this. Deadlines are super helpful to actually getting writing done. If you have all year to finish your novel your going to procrastinate . . . almost all year. But if you only have 30 days to finish writing 35K, you might not want to fall 10K behind in the first week. You have a lot of motivation to get that writing done. Something that is sometimes lacking in the writing world is a sense of community. Not so with Camp NaNoWriMo. You are assigned a cabin with a bunch of other cabin buddies that you can chat with throughout the month. It's wonderful! Unlike with NaNo in November, you can write anywhere from 10k-100k during Camp. I've found that 30k is a good pace for me. If I write 500 words in the morning and 500 at night, I'll be golden. Even if you don't have a lot of time during April, you surely have enough to write 10k. That comes out to about 350 words a day. I don't know about you, but I can write that much in a uninspired 15 minutes. This year, I plan on writing about 20k as a first draft and then 10k as part of a rewrite I'm doing on another novel. Last year I used Camp NaNo to finish two first drafts I was working on. But if you want, set a higher goal, like 65k and edit the first 65k of your WiP. Camp NaNo actually encourages rebels. Which is kind of awesome. Seriously. If you have an excuse for not signing up for Camp NaNo right now, leave it in the comments so that I or one of the other readers can smash it to smithereens. You really don't have a reason not to sign up, so why not just head over to Camp NaNoWriMo's website right now. Are you doing Camp NaNo? What are you writing? What are some other reasons to do Camp NaNo that I forgot to mention? Tell me in a comment. I've never heard of Camp NaNoWriMo before you. So, I'm just gonna rant all my worries and you can smash them to smithereens. Do you get in trouble if you don't accomplish your goal? Cuz I want to at least try but I don't want anything happen if I don't write everything. Which leads to my excuse. I'm homeschooled, and it's pretty intense, so I'm not sure if I'll have enough time to write much. I really want to do it, though…because I need motivation. Questions! Can the people in your cabin read your stories? Because I reaaaaallly need professional input. And what did you mean by 'encouraging rebels'? Ok there's my little rant. I volunteer for smashing worries to smithereens! -Do you get in trouble? Definitely not. It's a personal challenge; there's no penalty if you don't finish on time. And you can actually raise or lower your goal throughout the month if you want a bigger challenge or if you feel your original goal was too ambitious. -Your excuse: First off, homeschoolers FTW! Second, I don't know what your method of homeschooling is, but do you have intervals of five-ten minutes between subjects? Write! Computer being slow? Write! Going somewhere in the car? Write! (As long as you're not the one driving, that is.) Waiting for someone to do something for you? Write! It's amazing how much writing time you can find, and how much writing you can do in that time, when you put your mind to it. And you may need to take a day or two to say, "Ok, I'm not doing (fun thing) until I've written X number of words," but that's ok.
-Can people read your stories? There's a place on your Camp NaNo profile where you can post an excerpt from your stories. Otherwise, however, you need to look for a different site. -Encouraging rebels: There are those who do NaNo events to the letter- only working on one novel, not working on a previous project, not editing, etc. And then there are the 'rebels' who work on multiple projects, edit what they've written before the month is over, write something that's not a novel, work on a previously started project, etc. Camp NaNoWriMo is known for being more friendly to the 'rebels'. As far as finding people to critique, I'm a member of the Go Teen Writers community which has a blog, a facebook group, and a bunch of awesome writers who I sometimes ask to read and critique my writing. During November's NaNoWriMo you're supposed to write the absolute first 50k of a new novel. People that don't follow these rules to the letter are called 'rebels.' But in Camp NaNoWriMo the rules are more friendly to people who don't want to follow the November rules. Thanks for commenting Krissy, and thanks for the smashing to smithereens, Sarah. I'm totally doing Camp NaNo! I'm rewriting my NaNo novel from last November, unless I get a way more interesting idea before then. 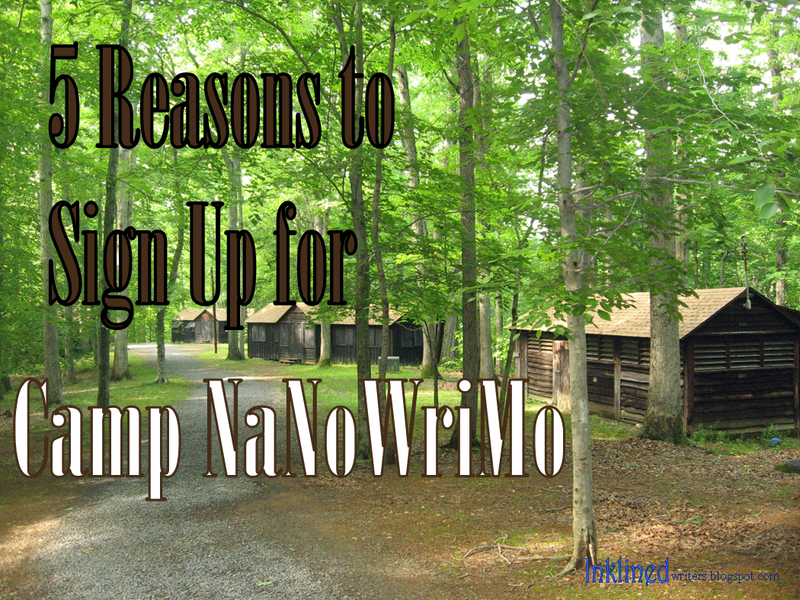 And I think you've got all the reasons to do Camp NaNo covered. Good luck with your NaNo project! Glad you'll be doing NaNo with me. I'm finishing my first draft of my NaNo '13 project myself. Good luck with your project(s) and see you this April! Yeah! See you and thank you for commenting. I haven't decided if I'm going to do Camp NaNo yet, but I'm leaning towards doing it. My only excuse (which is half-way legitimate, half-way procrastinating) is that I want to have my outline finished and perfected before jumping into a project. During NaNoWriMo I hadn't perfected my outline yet, and my story was kind of all over the place. HOWEVER, I think having a deadline for finishing my outline will do me good. We have, what? Two weeks? That seems some-what attainable. 2 weeks is totally do-able for an outline. Most of my outlining happens on one day, and then ideas trickle in more as I start to write the characters. This sounds like fun, when is it happening? How about the excuse of doing NaPoWriMo and DOOM in April at the same time? Im so doing it! Did my first Camp last July and got thirty thousand done with most of it the last week. Im going for the normal fifty thousand next month. November was so much fun. Not! I did about forty thousand in the last week because I gave up and then Im like, no! I.Am.Doing.It! So, I got the last thirty to forty thousand in about a week. Fun times, im not giving up this year! Wow! There's no way I could write 40K in one week. I try really hard to meet the daily word count, because once I fall behind I know I'm in some deep trouble. Good points. Though I thought that Camp NaNoWriMo went on during other months. April is a tough one for me. Does it go on in other months too? Great post! I am doing Camp NaNo next month and am so excited to get writing again. The structure, the community, everything about NaNo events make writing so fun and easy to go. Good luck. Will you be blogging about Camp NaNo as the month progresses? I will probably make a few notes about my progress as the month goes on, but I try not to write dedicated posts that solely revolve around me because that seems selfish. :) Thanks for stopping by! These are great! I participated in (and WON!) my first NaNoWriMo in November. I've been lamenting that it only happens once a year, when I stumbled upon Camp NaNoWriMo in my Facebook Feed. There's NO reason not to! I could come up with a million excuses, but no REAL reasons. So exciting! Yes, I love how much writing I get done during Camp NaNo and in November. I'm glad there are three a year, although this year I'm forcing myself to only to two, I think. At first, I thought that, no, certainly, and definitely not would I be doing Camp NaNoWriMo this year. My family and I are moving this week, and will have to stay at a hotel from Thursday to Sunday, and we'll be busy with the packing and unpacking. But then I discovered that I'm still a crazy writer, so I've signed up. I decided to be even more of a crazy writer this year and do a genre I have very little experience in: space science fiction. So this should be fun. But thanks for your post! I wouldn't have decided to do it if it wasn't for you. So glad to have inspired you! Even if you don't start writing until the 10th, it still wouldn't be hard to write 20K. That's only 1K a day, which is a totally doable goal. Also, I've written a space science fiction and happen to love it! I actually have quite a bit of experience writing (I've done NaNoWriMo three times and completed it each time, even starting over in the middle and not counting everything that I had written in the middle last year), so I'm not really concerned about being able to get it all done, just being sane by the end of getting it all done. I certainly hope I'll be able to enjoy Space Science Fiction as much as you do. Thanks for writing this post, and for your lovely blog!